Lam Research Corp. (LRCX) was reviewed on January 29th and it has continued to soar higher. Near the end of January I said this about the stock - "LRCX could move higher from here but I suspect we will see further sideways price action for the next several weeks." As an analyst one needs to be impressed when a security is extended or overbought and it still moves higher - traders and investors are bullish and looking beyond today's overbought readings and buying despite prices being bid up too quickly. In this daily bar chart of LRCX, below, we can see that prices have climbed about $50 or so from late December. LRCX is above the rising 50-day moving average line and above the still declining 200-day line. If we drew a downtrend from the March high and connected the other rally highs in May and August, we would see that we have broken that downtrend. The daily On-Balance-Volume (OBV) has moved higher the past few months and is above the highs of the past five months. The daily Moving Average Convergence Divergence (MACD) oscillator crossed the zero line in the middle of January and has continued to climb. In this weekly bar chart of LRCX, below, we can see a number of positive technical developments. Prices are above the declining 40-week moving average line. The weekly OBV line has turned up and looks like it has broken its downtrend from last November. A rising OBV line is a sign that buyers of LRCX are acting more aggressively. The weekly MACD oscillator crossed to the upside in December for a cover shorts buy signal and it is now closer to the zero line for an outright go long signal. 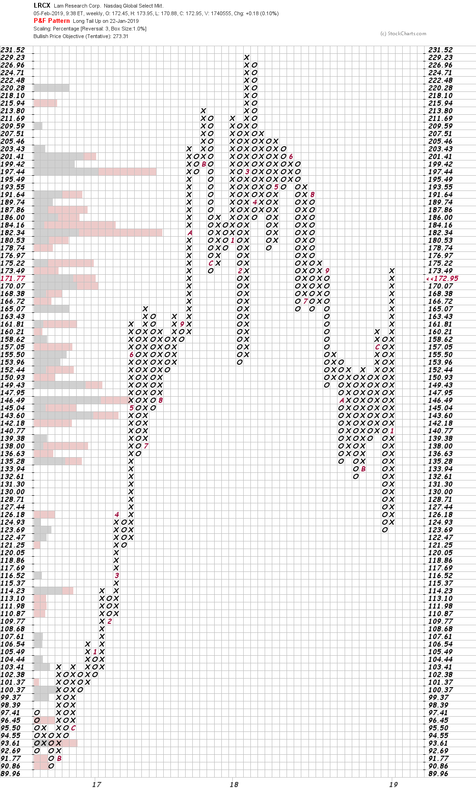 In this weekly Point and Figure chart of LRCX, below, we can see two important clues. First is that there is not overhead chart resistance based on Volume at Price bars on the left scale. Second is the $273 price target being projected. Bottom line strategy: LRCX has climbed higher and higher recently without a pullback or even a sideways price correction. Traders should consider this a sign of strength. Longs should raise sell stop protection to a close below $155. $200 is the nearest upside price target.